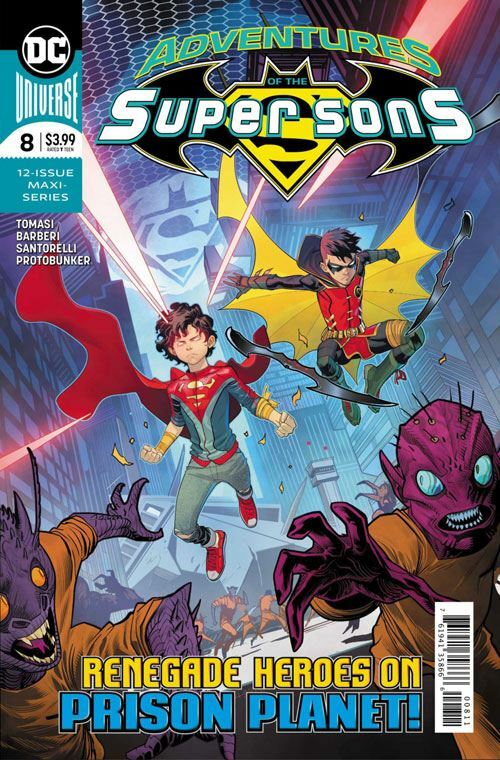 I’ve been hoping that Rex Luthor’s army of villain knock-offs would get a bit more play, and the latest issue of Adventures of the Super Sons gives us exactly that. Robin and Superboy are reunited, and reluctantly teaming up with Joker Jr, while Rex’s Injustice Army fan out across Takron-Galtos to stop them. There are some good twists along the way. Betrayals and surprise allies, and the whole way Joker Jr is developed. One can never be sure about trusting him. It’s a fun issue as well. Tomasi is so damn good at dialoguing this pair. I know I have said it before, but when Tomasi is giving them lines, I don’t need Robin and Superboy to be involved in a plot at all. They are just so much fun to listen to. But there is a plot, and even though it has wandered a bit during the run of the miniseries, it’s finally moving into high gear, towards the finale. Not much else to say about this one, nothing at all I can find to criticize. So I will just take a moment to mention that I hope these guys stick around. Young Justice has brought back the Connor Kent Superboy, and even Jonathan has been aged in the pages of Superman. I fear this miniseries might be the curtain call for the Super Sons. There is only one sure fire way to prevent that. If the book sells a heck of a lot of copies. So buy it. Buy two. Three would work as well. I need the Super Sons in my life.